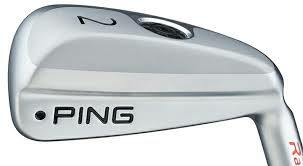 Ordinarily I wouldn’t think much about a driving iron, but when it comes with the Ping name, I get interested. Ping says its new Rapture 18-degree driving iron (suggested retail price $220) features significant tungsten weighting in the heel and toe to create a high MOI (moment of inertia) for a head its size, making the Rapture easier to hit than a long iron. At the same time, according to Ping, its wider sole gives the Rapture the playability of a hybrid but with much less spin. As a result, the club delivers a low, penetrating ball flight that maximizes distance and control. A key attribute of the Rapture driving iron, Solheim said, is its flat, 455 stainless steel face, which contributes to greater ball velocity and promotes workability because it has no bulge and roll. Solheim said the sole in the 17-4 stainless steel head locates the CG (center of gravity) low for optimizing launch conditions and turf interaction. The shaft in the Rapture is a half-inch longer (39.75 inches) than a standard 2-iron shaft. Solheim said Ping’s proprietary TFC 949 graphite shaft promotes greater momentum and inertia for improved energy transfer, resulting in faster ball speeds and more distance.